Thanks for making me a #FIGHTER!!! Who’s excited for the core de force launch tomorrow?? Who’s joining my next challenge group with this KNOCK OUT program?? I am so excited to announce that a brand new Beachbody home fitness program is going to be launched on October 31st! Core De Force is a 30 day total body transformation program that will rock your world. The best part about the program is that the only equipment you need is YOU! 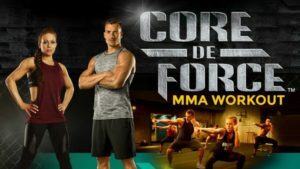 Core De Force is an MMA inspired program which inludes 3 minute “rounds” where you will get boxing, kickboxing and Muay Thai, knee-elbow combinations, bodyweight training and cardio spikes that will help you lose belly fat and shred your body. If you can focus on hitting it hard for 3 minutes at a time before you know it the workout will be over. I am going to be hosting a private test group for people who are ready to join me in this 30 day program. The nutrition plan follows the portion fix, but you will not receive another set of containers unless you want them! Each food category is measured out and explained in detail to you. The plan is meant to be SUPER EASY to follow so that you don’t get overwhelmed with to many options. Plus, I will be walking you through the entire nutrition plan as well. Comment below or message me if you’re ready to get started! I look forward to having you in my next challenge group and getting you in the best shape of your life! !